What Exactly is a ‘BALANCED” Approach? The ‘fiscal cliff’ that lies before us has brought forth many calls for ‘balance’ in approaches to reducing America’s yawning budget deficits. But what exactly is a ‘balanced’ approach? Is there a meaningful economic description or just a Solomonic split that, in fact, leaves the truly concerned worse off? Economic analysis offers two thoughts. First, with growth in mind, increases in revenue should be only a modest component of deficit reduction. The fiscal challenge is in part a recent acceleration in federal spending relative to GDP, coupled with a more worrisome acceleration in future Social Security and Medicare spending. These spending increases can be attenuated progressively and gradually by slowing the rate of growth of benefits to upper-income Americans. And recent research by Alberto Alesina and Silvia Ardagna of Harvard University shows that fiscal consolidations are less detrimental to growth when they are overwhelmingly about tax reform and spending reductions, particularly cuts in transfer payments. What if the public wants the larger government implied by the fiscal projections? Here lies the second economic lesson. In this case, revenues will, of course, have to rise substantially. But the present tax system cannot raise this much revenue at levels of economic growth to which Americans are accustomed. A tax reform toward consumption taxation would be required. In addition to being a less costly way to raise revenue, such a tax makes clear that all Americans must pay for large government benefits for all Americans. What then of the fiscal cliff? Note the importance of tax reform and of highlighting choices about spending in both scenarios. As a consequence, the 2012 discussion is more likely a ‘fiscal bluff’ (pun intended) to the fiscal cliff once more in 2013. Is the U.S. Closer to BALANCE? Not really. A key point we make in our introductory essay in BALANCE is that the ratio of U.S government debt to GDP departed from its historical pattern – rising in wartime, falling in peacetime – with rise of the welfare state and burgeoning deficits from unfunded ‘entitlement’ spending. A common reaction we have gotten to our core conclusion that different budget rules of the game are needed to right the fiscal ship is a crisp: At least it’s not so bad as in Europe. Not so fast. Total government spending relative to GDP in the United States is close to levels in Spain or even Sweden. But we’re ahead of Europe on pro-growth policy to help manage the burden of debt, right? Again, be careful. Newly elected French President Francois Hollande proposed large tax increases on high-income individuals, a corporate tax increase, and subsidies to government-favored industries – an anti-growth, fiscally damaging brew, to be sure. But U.S. President Barack Obama proposed large tax hikes on high-income individuals, a minimum tax on corporations, and subsidies for manufacturing as a government-favored industry. Welcome to Balanceofeconomics.com, a blog that Tim Kane and I are launching to share ideas about America, world history, and the concept of economic power. The blog is meant to help us brainstorm as we write a book together that is tentatively titled Balance: Why Great Powers Lose It and How America Can Regain It that will be published by Simon & Schuster in early 2013. Tim and I realized that if we are sharing ideas with one another then we might as well as share them with you. It must be said that what is written here is on our own behalf – individually – and does not represent the ideas of our employers, other associations, or even one another. We were inspired (book and blog) in no small part by Paul Kennedy’s Rise and Fall of the Great Powers which coincidentally is celebrating its 25th anniversary. Our core theory is the economics is at the heart of great power growth and decline, and secondly that political stagnation leads to economic imbalance. Imbalance happened to Rome. Imbalance happened to Ming China. It is happening to Europe, to Argentina, to Japan, to California, and may be coming to a superpower near you. We’ll explore topics such as power accounting, the role of political institutions, and the lessons history has for the current American institutional model. 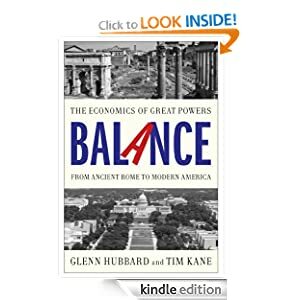 We will update the blog regularly leading up to and beyond the release of Balance, and hopefully will have shed some light on America’s economic paradox (and learned a thing or two from readers).